Speaker: Paul Doherty, CEO, the digit group, inc. This event is FREE to all licensed, practicing Architects, Structural Engineers, Developers, and City Planners located in Chicago, Chicago Suburbs, and NW Indiana. These seminars provide 2 AIA credits and earn PDH certification. Get more Details and Register for this event. Sign up for our e-newsletter and/or our contact form to be informed of our upcoming dates and seminar topics. 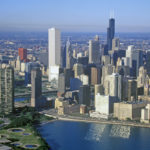 Our free seminars are perfect for Architects, Structural Engineers, Municipal Building Departments, Developers, Distributors, and Mason Contractors in the Chicagoland and NW Indiana area. All seminars are approved for AIA credit. 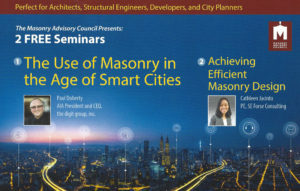 The Masonry Advisory Council is proud to offer these informative Lunch and Learn topics presented by professionals in masonry design, construction, and material options. MAC provides these Lunch & Learns FREE to Architects, Engineers, Contractors, and Developers in the Chicagoland and NW Indiana area. We’ll come to your office for a one hour presentation and provide free lunches to those attending the presentation. You’ll receive 1 AIA credit for each L&L! It’s fast and easy to schedule a Lunch & Learn, just submit the topic(s) you want and we’ll take care of the rest!